Become a Divine Club member and enjoy exclusive discounts and benefits at local businesses. You will be supporting the local community because for every dollar you spend with a local business, 73 cents will stay in the local economy. Our local businesses stimulate our economy; they also reinvest into improvements that make our neighborhoods and city better place to live. By supporting local businesses, we create more jobs that are at the foundation of our community. Enjoy discounts of at least 10% OFF every day, at your favorite local establishment. Save money by using the card at restaurants, hair salons, retail stores and for services! Join the Divine Naples Club today! We will send you a personalized card, which allows you to use your card in any participating local business. The list of participating businesses is frequently updated to include new businesses that partner with our program. 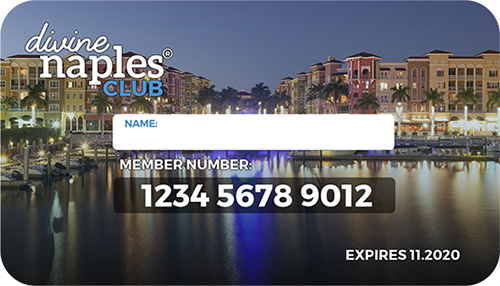 Club Membership for Naples, FL residents is FREE, after filling out this form please stop by our Visitor Center in Downtown Naples to present your resident ID and pick up your membership card.